Superintendent James Williams presented the Board of Education Wednesday with revised turnaround plans for the nine low-performing schools. But at the end of the day, those plans still have two fatal flaws, as far as getting state approval for them is concerned. 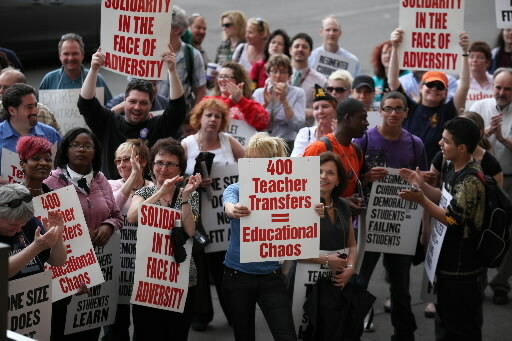 For one thing, the teachers union still refuses to sign off on the plans. No union support pretty much equals no state approval, state officials have said. Next, the district still has not tried to get input from parents or other stakeholders. (See above.) No stakeholder buy-in pretty much equals no state approval, state officials have said. When Deputy Education Commissioner John King Jr. was in town last week, he told just about everyone who showed up that what he thinks needs to happen is that all the key players be locked in a room, and nobody comes out until they hatch turnaround plans everyone can live with. King even offered to come back to Buffalo to help make that happen. A week later, there doesn't seem to be any effort to make such a meeting happen before those turnaround plans are due. Board President Ralph Hernandez says he's going to ask Oishei Foundation President Robert Gioia to convene that meeting, since Gioia offered last week to do that. Gioia says it's up to Mayor Byron Brown to convene that meeting. Brown has nothing to say about it, other than a "no comment at this time." A quick recap: The district has unveiled plans that, as they stand, will almost certainly not be approved by the state. Those plans are due May 9. Nobody seems to be making a move to take the necessary steps to get everyone at the table before then. Reminder: $54 million is at stake. And there's that pesky little detail of thousands of kids who need someone to get this thing figured out so that they have decent schools to return to in September. Some other highlights from Wednesday's board meeting are worth noting, too. Remember how the board president last week directed the administration to provide the board with copies of the school turnaround plans by last Friday? Well the board finally got them -- five days later, around 5 p.m. That was an hour into the committee meeting that was set aside to deal with the school turnaround plans. And most of that committee meeting was devoted to talking about something that had pretty much nothing to do with the turnaround plans. The district brought in Jim Pitts, UB's Henry Taylor and a Buffalo Municipal Housing Authority official to talk about a HUD planning grant their group got. The grant, which will be used to work toward improving housing stock along with schools in certain areas of the city, was announced six weeks ago. It was unclear why Williams chose to have them talk about this for most of the hour that was supposed to be spent talking about the school turnaround plans. Some people Wednesday night wondered whether that was done to draw attention away from the turnaround plans themselves. One way or another, the board spent all of about 15 minutes Wednesday night talking about these all-important school turnaround plans. And what little discussion there was lacked much substance because the board had not seen the plans beforehand. Williams told the board they have until Monday to get back to administrators with questions. Hernandez told me board members will be passing along copies of the plans to each of the affected schools to see if the staff in those schools agree with the plans. It looks like that's likely to be the extent of getting "stakeholder buy-in" -- board members finding out, after the plans are put together, who agrees and who doesn't. Followed by some possible last-minute tweaking of the plans. After the committee meeting ended Wednesday night and before the regular board meeting began, Mayor Byron Brown was seen milling around the board room. Curiously, he did not make any sort of public statement. And he managed to slip out before most of the media -- who were there in full force -- had a chance to talk to him. Unusual behavior for a politician. Before he slipped out, though, Buffalo News photographer Harry Scull asked the mayor why he was there. As a show of support for the superintendent, Brown said. And then took off before any of the TV cameras could get him on film saying as much.